CLEVELAND - As if the NBA finals weren't big enough, LeBron James has another major event in his life coming up. He has another son on the way - soon. Cleveland's All-Star forward, enjoying the highest point of his professional career, is also thrilled about the upcoming birth of his second son with girlfriend Savannah Brinson, who had the couple's first child, LeBron James Jr., in 2004. "It's great," James said Tuesday shortly before the Cavaliers left for San Antonio. "Any time you are able to have another child and something to live for and have responsibility for, it's always a big step in any man's life. And that I'm a part of the finals, something I've always watched growing up, it's something special." Brinson is due to deliver on June 17, when the Cavaliers are tentatively scheduled to host Game 5 in Cleveland. "No," James said with a smile. "I don't think so." If she goes into labor and the Cavaliers are still in Texas, James may not be able to get back to Ohio in time for the birth. The 22-year-old has discussed that possibility with his loved ones. "My family understands what's going on," he said. "We've sat down and talked and we know how important this is for me and how important I am to my teammates. Savannah knows that and she knows if there's an opportunity I can be there, I will. And if not, I'm going to support my teammates. She understands." James, raised by a single mother, said fatherhood has changed him. 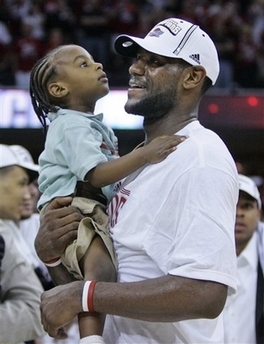 After the Cavs won the Eastern Conference title on Saturday night, he proudly carried his 2-year-old son around the floor of Quicken Loans Arena during the wild celebration. "You know you're not just out there playing for yourself," he said. "You've got responsibility. You've got a last name to hold up. I've got a son and another son that I've got to represent out there. I don't want to make them look bad. I want to go out there and make them look good." During the playoffs, James has stayed in close contact with Miami's Dwyane Wade, a close friend who recently welcomed his second child. "Everyone knows me and LeBron are pretty tight," Wade said. "The main thing for us outside of basketball is making sure his fiancee and my wife are healthy. Going through the process of having a baby, I had mine and everything went great over here and hopefully it's the same for him."